While not all of us agree with the use of RFID-enabled identification cards, it doesn’t look like we’ll be able to stop them from becoming mainstream. But if it’s going to become a widespread reality, they might as well be as awesome as possible. It looks like these OLED ID cards from Samsung, featuring a holographic picture of the owner’s head, come as close to being awesome as an ID card ever has. In fact, it’s so futuristic we might even be tempted to flash our IDs when it’s not entirely necessary. Samsung Mobile Display’s Specimen Display Card looks normal until it gets up close and personal with an RFID reader. Then the OLED display pops up with a graphic of your disembodied head. 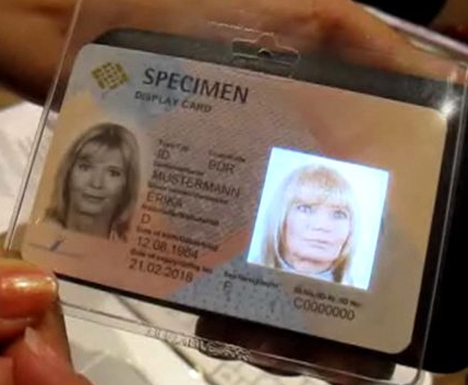 The 3D graphic is supposed to give authorities a 360-degree look at the card holder, presumably helping them to verify the card holder’s identity more easily. The viewer would also be able to zoom into the displayed face, giving them a chance to compare birthmarks, eye color and other characteristics that don’t come across so well in the standard ID photograph. See more in or under Various Gizmos. January, 2010.